The term “file manager” takes a different turn in the context of iOS. The sandboxed nature of apps on iOS ensures that, unless jailbroken, every app runs in its own isolated sandbox, thus eliminating the idea of a common global storage location. What you can get instead, is a category of apps that provide a storage container where you can save and manage your personal files. File Support: One of the primary features would be the ability to natively support common file formats that you come across every day. You want to be able to directly view or play the files stored within a file manager app, without having to export them elsewhere. Export/Import options: Next, the app should enable users to import and export files from multiple locations in various ways. That includes, having a decent Share menu (Open In feature), Storage Provider extension, iTunes File Sharing, WiFi transfer, WebDAV, etc., along with access to your Photos & Music library. Security: The iOS platform as a whole has been built with security at its core. And for the most part, your data is secure as long as you’re running the latest (unaltered or non-jailbroken) version of iOS on your iDevice, with a passcode enabled. Third party file managers could add additional layers of security, with better implementation of Data Protection classes, app-specific passcode and Touch ID protection. Cloud Integration: You also might have important data stored in the cloud. So, a good feature to look for in a file management app, would be the ability to integrate different cloud storage services. This would allow you to browse & sync your cloud files, directly within the app. Miscellaneous: A decent user interface, with local search, and support for different file operations, such as sorting, copying, moving, renaming, deleting, compressing, etc., is also preferable in a file management app. It could also include an integrated web browser and download manager to store files from the Internet. In this article, we have put together a list of iOS apps available on the App Store that fulfil all, or most of these criteria. We’ll now explore these apps separately. Documents from Readdle is one of the best file management apps for iPhone, iPad and iPod Touch, considering the extensive file support and list of features that it offers. It functions as document (MS Office & iWork) viewer, PDF reader, music & video player, photo viewer, web browser with file downloader, cloud drive browser, all integrated into one app. The app lets you import & export files from various sources, via Share menu, iTunes File Sharing, AirDrop, WebDAV and other similar options. It also provides a Storage Provider Extension to enable other supported apps to access its contents. Common file management features, such as sort, search, copy, move, rename, zip, etc., are available, along with List View/Grid View support, to enable you to view files conveniently. Documents supports passcode / Touch ID protection, to prevent unauthorized access to the app on your iOS device. The app also provides a dedicated folder for iTunes File Sharing, so that only files within that particular folder will be accessible from iTunes on a trusted computer. 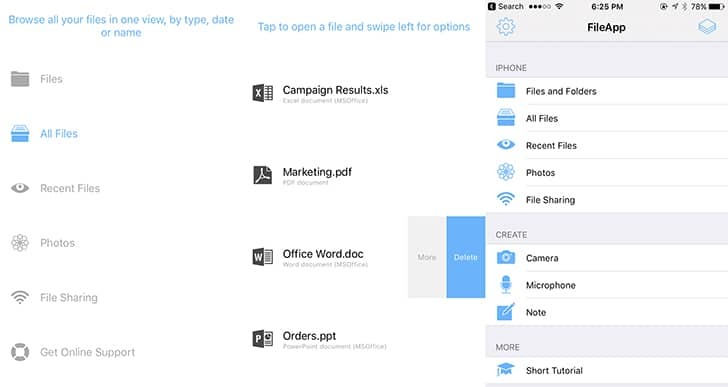 Documents app offers integration with iCloud, Box, Dropbox, Google Drive and OneDrive services. It also has an integrated web browser and downloader for downloading files from the Internet. Best of all, Documents app is available for free on the App Store, and that too for an ad-free experience! Pocket Drive offers almost all the features that you look for in an iOS file management app, in an intuitive, appealing UI. The app includes built-in support for Office and iWork files, Rich Text (RTF, TXT) files, photos (JPG/JPEG, PNG, BMP, GIF, TIF, ICO, XBM), popular audio & video formats, and compressed (ZIP) files. You can import files into the app using iTunes/WiFi Sharing or via the Share menu. Likewise, the Share menu can also be helpful in exporting files from Pocket Drive to other supported apps. It also supports importing of photos and videos directly from Camera Roll, or snap a photo or video directly within the app. Creation of text files and folders are also supported. One of the features that we liked about Pocket Drive is its auto-connect feature. Provided your Mac and iPhone are connected to the same WiFi network, your Pocket Drive files will be instantly accessible on your Mac’s Finder. For Windows PC, however, you need to set up the WebDAV connection manually. The app has a distinct UI for file management and organization. You can choose between grid and list view, sort files by date, name or custom, create folders, etc. It also includes security options like passcode and Touch ID lock, but those are “Plus” features, unlockable via in-app purchase. The app also has a built-in web browser and file downloader, which supports all types of downloadable files. It does not have an integrated cloud solution, but apart from that, Pocket Drive is a decent file manager for iOS. The free version of Pocket Drive offers limited storage (up to 250 MB), and excludes a few attractive features. To unlock unlimited storage, WiFi Photo Library, Security options, along with a few more add-ons, you can opt for in-app purchases, which range from $0.99 to $4.99. Or, you can separately purchase Pocket Drive + @$5.99 from the App Store. File Hub makes it to this list because of its intuitive UI and extensive cloud integration features. The app supports all common text, documents, photos, videos and music formats, along with suitable import and export options, including iTunes/WiFi transfer, Share menu, FTP, SFTP, WebDAV, SMB, and more. It doesn’t offer a Storage Provider extension, so you won’t be able to attach or upload File Hub files directly from other apps. But if the other app allows, you can import files from File Hub into that using the Share menu. As far as file organization is concerned, File Hub supports common file operations, such as move, copy, rename, delete, etc., along with sorting, searching, and compressing features. Additionally, it also provides video and audio playlist management, a relatively unique feature among file management apps. In the security department, File Hub offers access restriction using passcode and Touch ID. And as long as your iOS device or Apple ID authorized computer is not compromised, your File Hub data is pretty safe. Additionally, you can also lock individual folders with distinct passcode, if you wish to store your private data. One of the most defining features of File Hub is its extensive integration with cloud services. The app lets you link your Baidu Cloud, Box, Dropbox, Google Drive, OneDrive, SugarSync, Yandex and more. This allows you to seamlessly transfer files between your iOS device and the respective cloud services. But on the other hand, it does not include a web browser/file downloader feature. The free version of File Hub enables unlimited use of the product, with limited features. You can unlock all available features through a one time in-app purchase or by separately purchasing File Hub Pro, available on the App Store. FileExplorer is a free file manager app for iOS that offers a decent UI, and includes all the basic features of a typical iOS file management app, and much more. It includes an integrated PDF viewer, and supports Microsoft Office, Excel, Powerpoint, Apple iWorks documents, etc. File import and export options include iTunes USB File Sharing, WiFi transfer, FTP Sharing and the ability to open files in other apps using the Share menu. Inside the app, you can sort files by Name, Date, Size or Type, search for a particular file using the built-in search feature, and perform file operations, such as copy, move, rename, zip, etc. It includes an integrated music player, which supports a variety of music formats, such as MP3, AAC, AIFF, WAV, FLAC, APE, etc. Additionally, it also reads music playlist files, such as, CUE or M3U. Supported image formats include JPG, PNG, GIF, CR2, NEF, ARW, DNG, etc., while supported video formats include MOV and MP4. 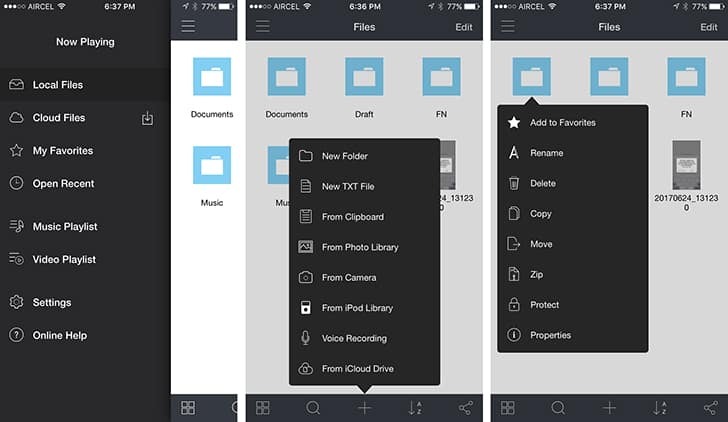 Like other apps mentioned above, FileExplorer lets you protect files with passcode/Touch ID. But one of the most striking features of the app is the ability to connect to multiple storage services,. FileExplorer can connect to network shared drives, such as macOS, Windows, Linux, Time Capsule, NAS via SMB/CIFS protocol, access to WebDAV Server, FTP Server and SFTP Server, as well as cloud storage services like iCloud, Box, Dropbox, Google Drive, OneDrive, etc. The Pro version of FileExplorer gives you access to more than one computer or NAS, manage files or network shares, and support additional video formats, including AVI, MKV, XVID, etc. FileApp is a free file manager app that is lightweight and clutter-free, and includes all the basic functionalities of a typical file manager app, without the facility of cloud integration. You can import photos and videos from Camera Roll, and other files using the Share menu. USB File Sharing via iTunes is also supported, along with FTP and WiFi transfers. You can even import files and content into FileApp, from the iOS clipboard. FileApp supports a wide variety of file formats, including PDF, Text, MS Office, iWork, HTML files, etc. For images, it includes a built-in photo editor that supports multiple filters & enhancements. For music and videos, MP3 VBR, AAC, ALAC (Apple Lossless), AIFF, WAV, H.264, MPEG-4 formats are supported. Finally, the app includes passcode/Touch ID protection, along with iOS data encryption. It does not include any integration with cloud storage services, but we think it would do a decent job as a lightweight, offline file management app for your iPhone, iPad or iPod Touch. 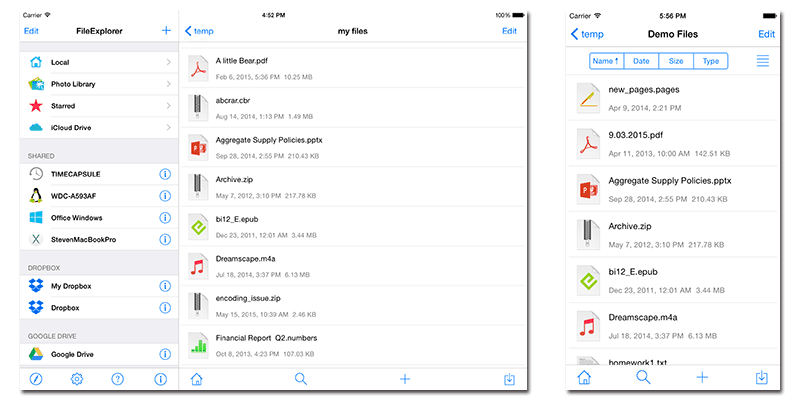 These were some of the iOS file manager apps that caught our attention. If you think that we’ve missed a good one, do let us know in the comments below. You can also check out our dedicated article on Download Manager apps for iOS here.